Since my A5 3.0tdi is going to be written off, Im currently looking to get an Audi s5 b8.5. Also is there anything I should be looking out for problem wise? I get 28 mpg in summer, probably closer to 25ish in the winter. Mine is tuned. I drive 60 miles a day 5 days a week, 59% generally clear single lane A roads (average 40 mph I guess) 40% free running motorway and 1% whilst I get out of where I live. On a later B8.5 there are very few issues as far as I know. Current: 2016 S5 BE | APR stage 2 | ADS with sports diff, active dampers & dynamic steering | AWE resonated touring | 034 rear sway bar | Canyon Run CR-15 strut brace | 20 x 9J 5-double-spoke (summer)/19 x 8.5J Y spoke in gunmetal (winter) wheels. I am sure @Dippy will be able to offer some in-depth analysis and replies to some your questions. Re: issues, B8s (pre facelift) had mechatronic failure and oil consumption problem which were, in some cases covered with under warranty and if you were real 'lucky', you'd have to cover the costs yourself. On B8.5s very few people have reported these issues. And most of them who have are in US where they abuse the cars a lot . @arad85 had his clutch slippage issue or something similar however believe it was down to the tune and APR UC option that he opted for - apologies if it wasn't the case @arad85. Apart from the ones mentioned above, there hasn't been any other reported on any of the forums. I forgot to add the mine is tuned too and I have got 195 pure local miles to the tank . That was 6 miles to and from work with an average speed to 15-18 miles/hour. What's "mpg"? Put fuel in and enjoy - what else is there to care about? @Slice636 - since you've stated that you're interested in a B8.5 it means that fortunately you shouldn't have to worry about some the problems that affected the B8, however the B8.5 isn't free of them. The biggest issue is the s-tronic gearbox, as you may already know. I believe that the 3rd version of the DL501 was introduced around May 2013 and so if you can afford a late 2013 or newer car then that's the safest option. However the 2nd version is still a lot better than the 1st, but make sure that it has been properly serviced (ATF and filter) no later than every 38k miles. Since we have seen that cars have been falsely advertised as having had this service it will be worth seeking proof (i.e. an invoice). Irrespective of the car's age make sure that the gearchanges are smooth - if you sense any jerkiness or hear any noises then walk away. Make sure the cooling system is OK. Early cars had pump & stat problems but IIRC @arad85 had a coolant issue on his. Also check oil level. Although very rare, some of these engines consume oil - usually a PCV issue. Of course if the seller knows this it will be topped up. There have been central locking & window problems on some cars so make sure everything works correctly. A few people (including me) have been hit by leaking headlight washer jets. Test them and then look for leak (pull flap with a fingernail). Longer term you'll want to do something with the crank pulley because enough of the OE ones have failed to class it as a known fault. This can usually be resolved when tuning. Slice636, q5man and Tashfeen like this. Oh - I also forgot. Audi made some S5s with only two doors. They must have had a batch issue so they bodged the bodywork and produced some 2-door versions. They are a bit lighter which is great, but they look so awful I can't imagine why anyone bought them. So check the advertisements carefully: "Sportback" = GOOD, "Coupe" = BAD. xpoweruk, Flowrider99, q5man and 1 other person like this. Jokes aside and like I said above and as always, Dippy has summarised it all in his one post. 2016 S5 Black Edition, 3.0 Supercharged. F&R Camera's, Led interior, reverse & number plate lights, RS5 Fr. brakes, R8 oil & coolant caps, 15 & 20mm H&R spacers, F&R Dashcams, 19" Rotors + 19" Black Ed Plus Alloys, 034 Trans Mount, ADS, Sweeping indicators. CR-15 front strut brace. CTS Intake. AWE Touring inc Resonated DP's, Bilstien PSS10 Coilovers. Coming soon - MRC Stage 1 ECU & TCU Remap. Sold - 2012 A5 b8.5 2.0 TDI Black Ed. R4M, xpoweruk and Tashfeen like this. BTW, my MPG is real MPG, not what the DIS says (it regularly says 32 at the moment on my commute). R4M, Slice636 and Tashfeen like this. It's normally the higher mileage one's that suffer with oil consumption. Big engined car's don't get thrashed like the teeny weeny 2.0litre and smaller one's. So carbon builds up on the piston tops and starts to stick the rings . That's why people think it's the PCV you start to suffer with blow by putting extra pressure in the crankcase. Just to be clear, I was going dual pulley and ultracharger and both times I "went" ultracharger, the supercharger clutch failed. Note that only affects cars from mid 2014 which have the CREC engine. Mine seems OK, but I have read reports of it failing on stock A6/A7/Qx cars in the US. I'm faster than 99.9% of cars around here anyway which is all that is needed. Was it interesting enough to post your experiences of the 0.1%? Alarm bells. So, @arad85 I can't recall if it is something you posted in your threads on elsewhere during a similar discussion but would you please mind explaining the 'symptoms'. If the supercharger clutch slips then you'll get an engine check warning because the ECU will detect the discrepancy in revs. Total failure would likely result in limp mode. I don't think there is a risk of collateral damage, but the clutch is not cheap and it requires a special tool to replace (MDM Technik didn't have one when I asked, but MRC does). My car has 06E 145 105 N but there are several revised versions, the latest being "S". i do a regular drive between winchester and bristol (90 miles each way) which is mostly motor way, but in this heat hit over 40mpg with the aircon on the whole way last 3 runs! tank i am getting 360miles between red and full which is about £65 of the good shell stuff. other shorter more 'typical' drives i am getting mid 30s on mpg, rarely is it in the 20s, been incredibly chuffed considering superchargers are meant to be thirsty buggers. I have just completed a drive of 113 miles on a mix of A and B roads. I had some congestion (7 sets of traffic light roadworks), a few short but quick dual carriageways and some fast overtaking on single lane A and B roads. I have averaged 31.8mpg according to the DIS at an average speed of 44mph. The fuel tank on the S5 Sportback is quite small unfortunately. 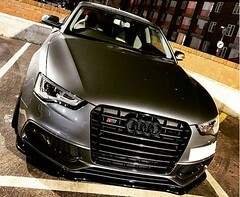 Audi S5 Black Edition Sportback (2014). 3.0l Supercharged V6, Mythos Black, Drive Select, Sports Diff, Dynamic Steering, Technology Package, Lighting Package, Storage Package, Super Sports Seats with Drivers Memory, Flat Bottom Steering Wheel. On my daily, I don't get much of a chance given it is mostly single carriageway A roads. You can't really do anything on a motorway either even if there is space as you're at a legal limit anyway. The only time I have had any half-way decent was with a Porsche 911 who was - I think - surprised by how quick I was - he got the jump on me but by the time we'd run out of speed I was leaving him. I think he was trying to show off to his ~12 year old son in the passenger seat... (you'd not get me doing that... I don't have a son...). Pre-tune I was relatively easily seen off by an AMG A45 which was one of the reasons I agreed to be tuned on such a new car I think he'd have a different experience now. As @Dippy said. Light and limp mode. I had both go whilst being tuned, so the tuner replaced FoC twice... Either I have a particularly grumpy supercharger or there is an inherent weakness there. I'm not about to find out which - I'll leave that to someone else. Thanks @Dippy and @arad85 - much appreciated! From what I have read, I can believe that there is probably a relatively wide tolerance in what the clutch can cope with. However in your case APR was taking the engine to the limit with the high drive ratio, the UC, and high octane fuel. I could believe that your clutches were guaranteed to fail. You'd think that APR by now must have collected some data to evidence that the SC clutch failure is related to their UC tune (or maybe not) including all the other associated changes. Do we know if the US guys are experiencing the same issues and if so how many of them with the UC upgrade have changed their SC clutches? Second time around we were on Tesco's Momentum.... Went before it got the chance to go on the dyno (which was a pity given the mechanic was claiming it was "really nice").... And by "the mechanic" I mean the person who is the the head APR tech in Europe. I can't remember for sure but I think there was a post on Audizine about someone who jetwashed their engine and then it wouldn't start. There were then replies from several other owners stating that they had done the same to their engines and, although a few took minor precautions, they had no problems. To me that suggests that some engines may be more susceptible to water ingress than others, and for that reason I think you made the right decision to avoid that one. Continuing the hijack, I am a fairly regular reader of Audizine and I have come across very few posts by owners of A6/A7/Qx 3.0 TFSI cars which have been ultracharged, and of those I am fairly sure they were pre-CREC engines. So I'm not sure what data APR have - possibly they only have data from a very few cars, one of which is @arad85 's. However the point is clear - being a clutch, the CREC supercharger clutch will have a torque limit. Clearly at some point in the tuning stages that limit can be exceeded. The only solution is to uprate or modify the clutch. However if you remember from when we were waiting for the SIMOS 16 ECU to be cracked, there was a worry that maybe nobody would, because the market to tune the CREC engine might be too small, and the attraction to work on the B9 instead too strong. Well I would suggest that the market to provide CREC tunes beyond what the supercharger clutch can take is definitely too small for anyone to spend any R&D on. I'd say that by contacting Eaton, @arad85 has already done more investigation than anyone else! What year was the b8 and b8.5? Were there mechanical or electrical updates from b8 to b8.5? Yes. Like @Dippy mentioned above DL501 v3 came out mid 2013 (May 2013 I believe). Earlier models had mechatronics issues. Oil consumption on B8s was an issue too due to PCV valve, less so on B8.5s so definitely revised. B8.5 also got electromagnetic power steering compared to hydraulic in B8. B8.5 also has lighter crown gear central differential. Another one was upgraded MMI (3G+ in B8.5). And that's all I know. Do you mean electro-mechanical power steering, @Tashfeen ?